Self Watering systems for Your Garden Plants. It doesn’t get much simpler than sticking one end of a braided rope in your plant soil and the other in a container of water to keep your plants happy while you’re away on holiday. Top wicks are normally used as temporary, holiday irrigation systems. Bottom wicks or sub-irrigation systems, must be set up when the plant is first introduced into the planter. In both cases, the wick is generally composed of a thick, fibrous material and set into a container full of water. Capillary action draws the water into the soil as the plant needs it. This system consists of porous terracotta pot that is planted into the soil next to the plants roots as a water reservoir that has to be topped up from time to time. The Terracotta pot is porous allowing water to seep through very slowly. The plant roots are naturally attracted to this moisture and gravitate towards the source. The roots then wrap around the pot takinge only what water is required for the plant to thrive. This system provides the plants with even watering without the dangers of fertilizer salt build-up or root rot. You can either buy or create your own self-watering pot. Containers, planters, pots and troughs. Potted plants can dry out rapidly, particularly in warm weather, and need regular watering to keep their roots healthy. There are also a few simple rules to remember. Water twice' Water once and then wait for 15 minutes to allow the water to soak through the compost, then water again. This will ensure that the complete root ball and compost is moist throughout. Use warm water: Let water warm up to ambient temperature before use. Applying cold water from the tap to: warm root system can cause the plant to go into shock and suddenly wilt. If you are in a hurry, add a little hot water to the watering can to warm up the contents. Get good drainage: Check that the drainage holes in the base of pots are kept clear to allow excess water to drain away. Make sure that all containers are raised off the ground using pot feet or bricks, or are standing on gravel or clay beads if they are in saucers. 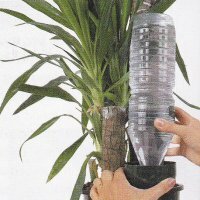 This will prevent water from building up in the pot and avoids damage to the roots. Clay beads retain moisture and will help to humidify the air around house plants and in greenhouses. Rule of thumb: It is not always easy to gauge when and how much water plants in planters really need. 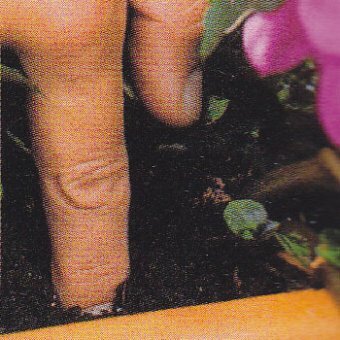 One way is simply to insert a finger into the compost - if it feels moist, do not water. If it is dry, water well to moisten all the compost, but allow excess to drain out of the planters. The weight of the planter is also a good guide: Pick it up and if it feels heavy it will still be moist, if it is light then water well.